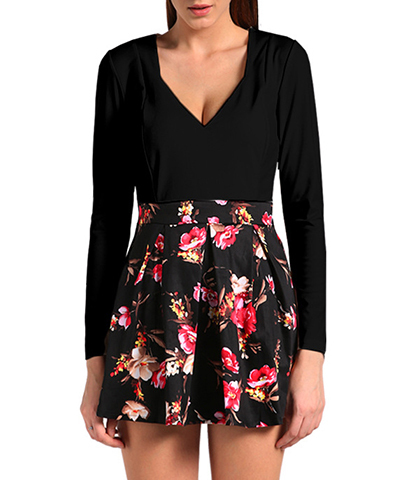 This charming two tone dress is made of a solid black top and a flowered skirt. The top has princess seams which naturally curve with your body’s shape, tapering to a trim waistband at the skirt. The full skirt flares out at the hemline so it sweeps easily around your legs. A small invisible side zipper gives your room to get into this fine garment with a problem. The plunging neckline adds feminine charm and allure to this outfit. Small size; shoulder 33 cm, sleeve length 59 cm, bust 78 cm, waist 68 cm, length 77 cm.